Vaccinating our children is fairly commonplace in the United States. But many adults don’t know which vaccines they need, and even fewer are fully vaccinated. Each year, tens of thousands of adults needlessly suffer, are hospitalized, and even die as a result of diseases that could be prevented by vaccines. In 2014, only 28 percent of adults ages 60 and older had received a shingles vaccine and only 20 percent of adults older than 19 had received a Tdap vaccine. Vaccine-preventable diseases make you very sick, and they can also make your family members sick. You can help protect your health and the health of your loved ones by getting your recommended vaccines so you don’t spread the infection to them. Babies, older adults and people with weakened immune systems (like those undergoing cancer treatment) are especially vulnerable to infectious diseases. They are also more likely to have severe illness and complications if they do get sick. Summer fun often includes lots of time outside, and more than likely some of that time is spent barefoot. When shoes are optional, cuts and scrapes happen more often. Bacteria in the soil can work their way into your body through those cuts and scrapes and make you sick with tetanus. 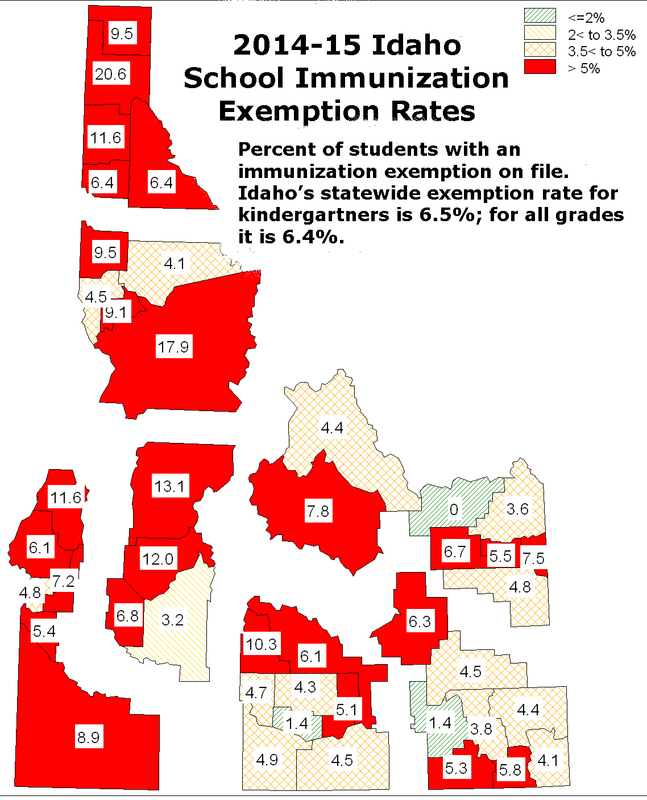 New vaccination exemption data from the Centers for Disease Control and Prevention (CDC) shows Idaho led the nation for school immunization exemption rates during the 2014-2015 school year. The recently published data show 6.5% of Idaho kindergarten students had an exemption on file for at least one vaccine when they registered for school. Idaho allows immunization exemptions for religious, medical, or philosophical reasons. Of the 6.5% of Idaho’s kindergarteners with an exemption on file, 5.6% were for philosophical reasons, while 0.3% were medical and 0.6% were religious exemptions.